A Flag between Two Families: "We are Soldiers Still"
A Flag between two Families Friday evening, February 20th. (Army Ret.) Major General Alfredo A. Valenzuela & Joseph L. Galloway Nationally Syndicated Columnist & co-author of: “We Are Soldiers Still” brought in and hosted a very special film that was screened at the Drop Zone Café. Donations were collected to help in the making of the film which also provided any donation contributed by a donor to have their name, a “fallen brother’s name,” or a local military association’s name to become a part of the film’s end credits. “As a proud veteran of the Vietnam War, and appreciative of efforts portraying truthfully the lives of fellow soldiers, I am proud to lend personal and financial support toward, A Flag Between Two Families,” said Spurs owner Peter M. Holt Vietnam Veteran. The funds collected will help the Vietnam-based documentary, “A Flag Between Two Families,” which is the healing story of the bittersweet relationship between nine courageous men from Charlie Company, 1st Battalion, 5th Cavalry, Airmobile and the pain-stricken family of their fallen “brother” Corporal Ramiro “Peter” Olivo of Eagle Pass, Texas, killed in action on May 9, 1968. The evening included a short screening of the 15 minute trailer of the documentary; a conversation either the film’s writer, director and producer; an opportunity to meet Charlie Company and Olivo family, sister Tina Olivo, members; to learn more about how a donor’s gift allows them to become part of the film’s end credits; and to meet co-narrator of the film, Joe Galloway, with his latest book available. Participants: (ret. Army) Major General Alfredo A. Valenzuela, Tina Olivo, sister of Corporal Ramiro Olivo, President Delia Guajardo US Military Parade Assoc., Steven Davidson President Little Bear Productions Co., (Army Ret.) Major Jimmy Casias, (Army Ret) SGM Balderama (Army Ret.) Sgt. Major Benito Guerrero, (Army Ret.) 1st Sgt. Raul Villarreal, (Army Ret.) Master Bill Robinson, 173rd Airborne BDE Assoc., (Army Ret.) Sgt. Jesse Salcedo -Nominee Medal of Honor & Sandra Jean Salcedo, Commander Joe Valdez and Recruiter Rita Ho, American Legion, Master Sgt. Roy P. Benavidez #400, (Army Ret.) Sergeant First class Jose Hinojosa Korean War POW/Veteran-Vietnam Veteran, Veteran J.R. Garza Veterans Advocate. Cpt. Tony Mandujano (Army Ret.) 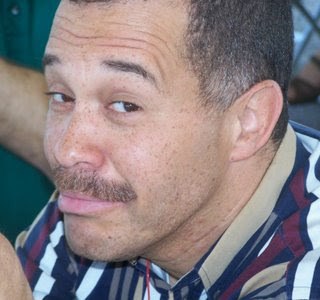 US Army Ret.-Photojournalist and many more…. Texas is about to consider legislation to make newborn screening for cystic fibrosis mandatory in the state. Currently, not all babies in Texas are screened for the disease. Tell your elected officials in Austin to screen all newborns for CF. Newborn screening gives people with CF a better chance at a longer life and improved health. Some children with CF do not display symptoms for a couple of years. Newborn screening identifies the diagnosis earlier and allows doctors to start treatment immediately. Those who receive treatment early on tend to have improved height, weight, cognitive and lung functioning, fewer hospitalizations and an increased lifespan. Texas has the fourth largest population of people with cystic fibrosis in the U.S.; however, it is one of only two states that have not made screening mandatory for every newborn. Help ensure that every baby born in Texas is screened for cystic fibrosis by writing your elected officials in Austin now. Friday, March 13th from 5 to 8 p.m.
Join SAMA in celebrating the opening of two new exhibitions by San Antonio artists in the Cowden Gallery. Ry Cooder and Vincent Valdez will present the installation El Chavez Ravine, a mural painted on a 1953 Chevy ice cream truck depicting the displacement of the Los Angeles Chicano community by the developers of Dodger Stadium. Hernandez's installation includes scupltures, wall paintings and drawings referencing everything from Disney to psychedelia. Sunday, March 1st, 1 to 5 p.m. Free with Museum admission New for 2009! Join Roman re-enactors Legion X Fretensis to dress up in Roman costumes, participate in the Olympics and other fun activities! Children and families are invited to explore the collections, create art and share Sundays with the family. Enjoy creative and interactive activities like sketching, painting, storytelling, films, performances and more. The Fiesta Commission is scheduling its annual Media Day for March 12th from 2 to 4 p.m. @ the St. Anthony Hotel , 300 E. Travis St . This is a "show and tell" opportunity for many of our 101 local nonprofit organizations and area military groups to inform you reporters and editors about both their Fiesta events and the groups that sponsor them. We encourage you to talk with as many event people as you can. They can tell you how Fiesta never ends because these organizations are helping their neighbors every day of the year. That's a lot of story ideas! At the end of the afternoon you can pick up your media kits and Fiesta 2009 media passes. The Fiesta San Antonio Commission is a nonprofit organization that plans, coordinates and preserves Fiesta San Antonio through the support of its participating member organizations. Visit its website at www.fiesta-sa.org. Our next meeting is Monday, March 2nd @ 6 p.m. @ the Davis Scott YMCA @ 1213 Iowa at the corner of S.New Braunfels. Thanks to Jack Orbin for a $5,000.00 Donation to www.KROVFM.com. 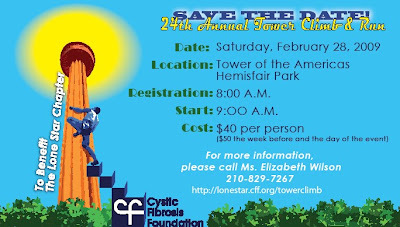 24th Annual Tower Climb, Saturday, Feb. 28th @ the Tower of the Americas, Hemifair Plaza with a start time of 9 a.m.
Steven Stoli's Backyard Theatre presents "Peter Rabbit"
Celebrating his 107th anniversary, Peter Rabbit is up to his old tricks again. With the help of a narrator, Peter and his mother go on an adventure in Mr. McGregor’s garden. The narrator will pick children from the audience to play all the other roles, from Flopsy, Mopsy, and Cotton Tail, to Mr. McGregor, Lettuce, Tomatoes and Carrot tops. With catchy songs and lots of help from the audience, Peter Rabbit will eat, chase, hide and seek his way into the lots of fun and frolic. Fun for the whole family and bring your cameras. Directed by Paula Jo Peterson. Actors Jordan Hogan and Larissa Reynosa will be playing the role of Peter. What a stack of blessing you have piled up for those who worship you, Ready and waiting for all who run to you to escape an unkind world. Thank you so much for your support in watching and sharing these video’s to the world. 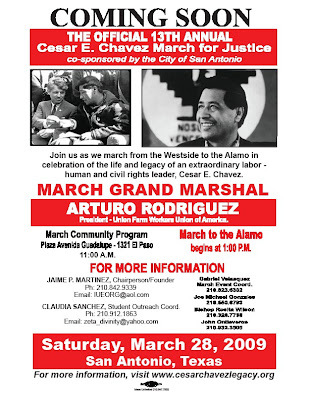 The Official 13th Annual Cesar E. Chavez March for Justice, Saturday, @ 1 p.m. March 28th with March Grand Marshal Arturo Rodriguez, son-in-law of the late Cesar E. Chavez. Saturday, Mar. 7th, is the 30th Anniversary Gala for UTSA's Pre-Freshman Engineering Program. (PREP) The Program was founded by UTSA Professor Dr. Manny Berriozabal. Proceeds from the event will support PREP students and scholarships. PREP began at UTSA in 1979 and has expanded into a partnership of local colleges, universities and school districts. The program provides a rigorous seven-week summer mathematics-based curriculum for middle and high school students. PREP is designed to motivate and prepare middle and high school students for success in advanced studies leading to careers in science, technology, engineering and mathematics fields.The highlight of the evening will include the announcement of PREP Distinguished Alumni Awards in areas of science, technology, engineering and mathematics. 6:30 p.m. Cocktails, 7 p.m. Dinner; Saturday, March 7th @ Hyatt Regency Hotel, 123 Losoya, San Antonio. Reservations:$85 for single seat. Tables available. Deadline for reservations is Friday, Contact: For reservations or additional information, call (210) 458-2060 or visit prep-usa.org. Congressman Ciro Rodriguez (TX-23) hHosts U.S. Military Service Academy Information Day for students, parents, counselors and educators interested in finding out more information or applying to a military service academy. Sunday, March 1st @ 2 p.m.-4 p.m. @ One UTSA Circle Main Building, Ground Floor, 0.104. Use the north entrance off Loop 1604 at the John Peace Blvd/La Cantera exit-John Peace Blvd. merges into One UTSA Circle at the Main Building . Parking lot 4 4A are the most convenient. The South San Antonio Chamber of Commerce is proud to announce its 4th Annual City South Festival on Sunday, March 29th from 11 a.m. to 7 p.m. at Brooks City-Base at the corner of S. New Braunfels and S.E. Military Drive. This event is free and open to the public. Booths are available to non-profit organizations for a $100 rental fee. Call 210-533-1600 to reserve a booth. This year’s event will feature an Iron-Chef Style Student Culinary Competition with area high schools and a Student Visual Arts Show and Competition featuring students from Brackenridge High, Churchill High, East Central High, Edgewood Academy, Highlands High, MacArthur High, McCollum High, Navarro Academy, Lee High, and St. Mary’s Hall. Scholarships will be awarded in the categories of art, culinary arts, and music. Food, fun, and great music will round out the event’s exciting line-up, including the popular Central Catholic Jazz Band, East Central High School Jazz Band, Southwest Middle School Jazz Band, McCollum High School Jazz Band, San Antonio Blues Society/SA Blue Cats and Henry Brun & the Latin Playerz. The South Chamber's programs are directed by the combined efforts of volunteers and professional staff working to build a better economy and provide business opportunities for its members. This Chamber is an advocate for the Southern Sector of Bexar County and concentrates its efforts in the following areas: accessibility to higher education; sustainable economic development; and diversity in housing. Visit southsachamber.org or call (210) 533-1600 for more information. The 9th Annual "Great Conversation" was hosted by UTSA Institute of Texan Cultures,, Tuesday, Feb. 24th. The 9th Annual "Great Conversation" was hosted by UTSA @ the Institute of Texan Cultures, Tuesday, Feb. 24th.